I was asked to write about this with my experience in making my transition to electric shaver. I hope this helps as there might be others that have lost the steadiness in there hands for one reason or another and find the safest way to shave is with an electric shaver. I had never given it much thought until it happened to me. I know there must be others out there so feel free to post on this "Wet Shaving" forum as a lot of the modern electric shavers can be used either wet or dry, and that's what this is about. Not to be without a rotation, I own a Norelco 9300 Wet/Dry shaver and a Braun Series 9 Wet/Dry shaver. Two of the most popular brands out there. Now, both claim to be wet/dry shavers but there is a big difference between the two. When Braun says wet/dry, they mean you can use it in the shower with water or at your sink, and you can rinse out the cutters with water. Norelco on the other hand actually means you can use it as a wet shaver with lather. If I choose to do so, I can prep my face just like I would with a blade and use the soap of my choice. Instead of the thick rich lather we like with a blade, the Norelco works best is the lather is a little thin (more water). You treat the Norelco as you would your double edge by making a few passes then running the shaving head under water to rinse off the excess soap, then continue shaving. I find the Braun gives the closer shave but the Norelco is quieter and has less irritation. I cannot get BSS with the Norelco but I can get a DFS that last all day. That is great information Johnny. Thanks! I know it is pretty early to ask, but what combination you like best? Have you tried shaving in the shower with the Braun and lathering up with the Norelco? What about your post shave? I know better than telling dad what to do, but if I can give him a tip or two that makes things better, that will make both of us very happy and grateful. Thanks again and please keep us informed. Great info. I suppose I'd have to go with the lather option as I enjoy the process of making lather so much. Great to have you still active in your caped moderator role! You'll be teaching me stuff for years to come. (11-28-2017, 05:33 PM)lloydrm Wrote: That is great information Johnny. Thanks! Dry Shaving: You can use both dry shaving. In that case, after giving my face a good wash and applying a hot towel, I apply Williams Lectric Shave then shave with either one. Just pends on the mood. This is the only way I shave with the Braun. 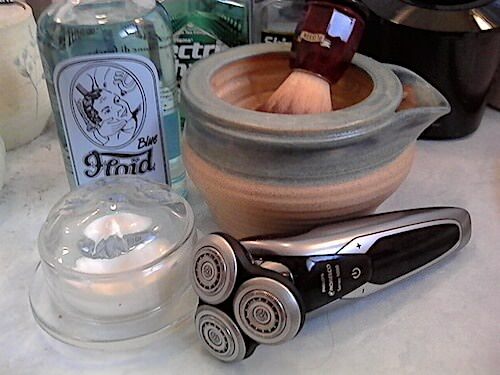 Wet Shaving: I prepare my face as if I were using a blade. I can use any of my favorite soaps, but I have also found the Nivea Shave Cream/Foam or the Nivea Shave Gel works great with the Norelco. As for as post shave, skies the limit. My standbys are Floid Blue and Mennen Skin Bracer. But I still use my Bay Rum, Speick, and other after shaves. I do not seem to need a balm using either is the shavers. I used to have a panasonic wet/dry electric about 20 years ago that worked well. (11-28-2017, 08:11 PM)bkatbamna Wrote: I used to have a panasonic wet/dry electric about 20 years ago that worked well. The Panasonic wet/dry is a nice shaver. The price tends to run higher on the Panasonic's and the newer 5 blade shaving head is a little to much for me. My personal favorite in the Norelco 9300 that I have now. But electric shavers are just like razors, everyone has a favorite. (11-28-2017, 09:51 AM)Johnny Wrote: I was asked to write about this with my experience in making my transition to electric shaver. An epoch or two ago, when Campbells had just introduced it's new "Primordial soup" I tried electrics. I'm sure they've changed/improved a lot since then but I found back then what you refer to in your second to last line about Braun and Norelco. Funny. Vast improvements over the years. But trust me, it's not out of love for electric shavers that I've changed. I know John, I know. My own day of change is getting close. When I was a youngin’ I used electrics. The rotaries would give me wicked razor-burn on my neck, while the foil ‘side-to-side’ Braun types did better. Both took a long time to shave though. Johnny - do you run into any razor burn (or have you ever?). Is the shaving time a long process? (11-29-2017, 06:16 PM)mike_the_kraken Wrote: When I was a youngin’ I used electrics. The rotaries would give me wicked razor-burn on my neck, while the foil ‘side-to-side’ Braun types did better. Both took a long time to shave though. I have not had any problem with razor burn. I use no pressure, I just let the rotary heads or foils glide over the surface of my skin. I also start with the upper lip area, then lower lip and chin, then the neck. I do all this before the heat builds up in the shaving heads. As for as actual shaving time, five minutes max. Thanks for this. I am heading in that direction. I’m in the process of switching to carts due to essential tremor. Hopefully that will work for a long time; but I suspect sooner or later the next step will be electric.. I laugh when I read the “never going back” posts. Time and age march on dragging us along, whether or not we want to go. I too must use an electric for the time being. I found a Panasonic Arc 4 on Amazon for a great price. I lather up with a light layer of CO Bigelow and do 2 passes. DFS for sure with great comfort. I am very pleasantly surprised. The Panasonic is a breeze to manually clean using the Sonic mode. Hope all is well with you and thanks for posting this. Johnny, again I hate to hear this. Having bought some products from you in the past I always felt privelaged to own something that once was in your den. On a side note, my grandfather passed away in May of this year. He was my best friend and taught me a lot. I think I mentioned in one post back in the day that I never saw him with a beard. In his last couple months I sometime saw him with stubble, but that’s it. It seemed as if whatever he shaved with was magic because he never had weepers, nicks, or a single piece of hair on his face and it always looked BBS to my eye. When going through his bathroom drawer I noticed he had been using a cart and canned goo for who knows how long. It’s amazing what you can do I guess after being on this earth for 87 years like he had. Last month during Thanksgiving my grandmother brought me a special gift of his. A bag that’s had a shave brush and a tin of soap from Avon. I knew he had used a brush, soap, and DE at one point as we had some discussions about it. How I wish I had the time to ask him more questions. The brush has seen better days as I can tell it got a ton of use. The Avon soap is brand new and has a classic scent to it. I’ll never use either, but will always cherish them. I had no intentions of derailing your thread, but sometimes when I read your post they make me think of him and the “older” guys and what they have experienced in the shaving world. I always like to remember a quote from Marco on B&B “ a true gentleman shaves every day”. I like to think that’s what guys like you and my grandfather did, shave every day as he was and you seem like true gentleman. This is just a follow up on my original post. I posted this on the Shave Nook facebook page and was asked to post it here. 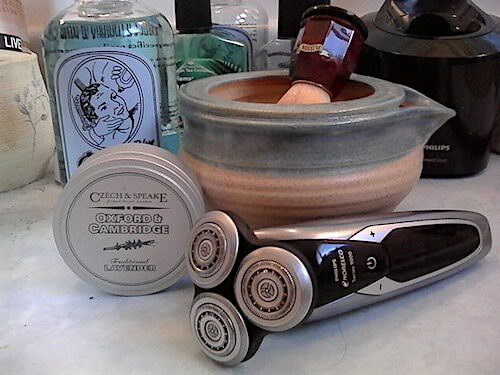 "I have been wet shaving all of my life using either a DE, SE, or straight razor. Due to some medical issues I had to make the switch this year to an electric shaver. One of the things I always enjoyed about shaving was the prep, brush, lather, and post shave. So, I started researching wet/dry electric shavers and after trying three of the post popular brands, I settled on the Norelco 9300 shaver with it's own cleaning station. Now doing a dry shave using Williams Lectric Shave as a pre shave, I can get very good results. But, when I prep my face and use a good soap or cream producing a good wet lather, I can get a shave as close as any bladed razor that I have ever used. 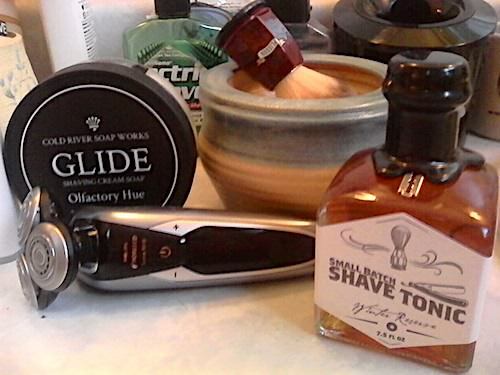 One soap in particular, Glide by Cold River Soap Works, works extremely well with the Norelco. So, when you get my age and the old hands are not as steady as they use to be, all hope is not lost for a good shave." 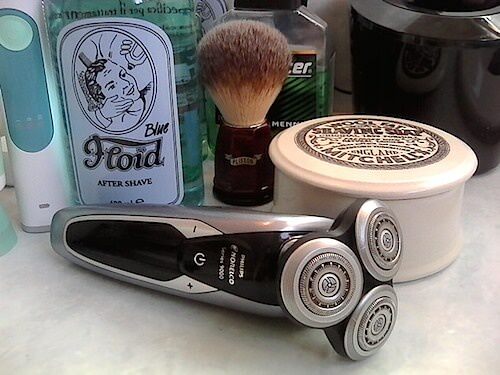 I might add to this, my Oxford & Cambridge, MWF, and Martin de Candre work quite well the the wet/dry shaver. Great post and pictures Johnny. (12-27-2017, 02:02 PM)Johnny Wrote: This is just a follow up on my original post. I posted this on the Shave Nook facebook page and was asked to post it here. Thanks Johnny, I'm going to have to charge up my Phillips Sensotouch 3d Shaver and see how it does when l lather up with MWF. It looks like yours has the same shaving heads as mine. Nice to see that Floyd Blue! You turned me on to that juice.